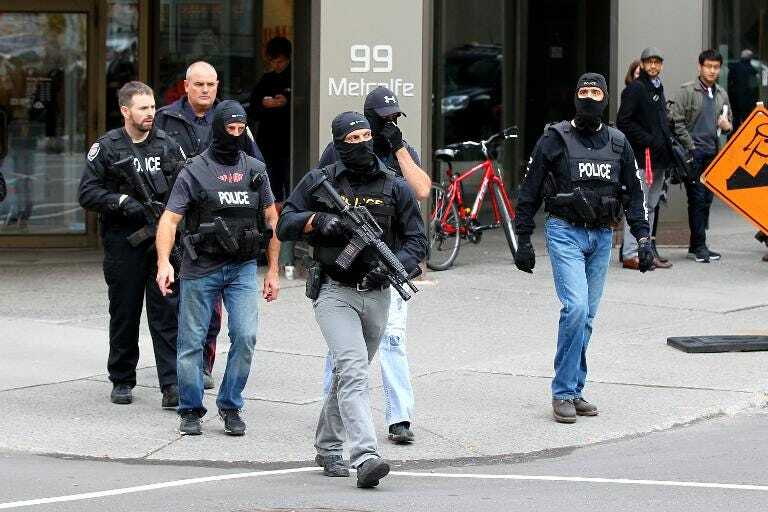 Armed police patrol in Ottawa on October 22, 2014, following the attack on Canada's parliament by the troubled Michael Zehaf-Bibeau. October 24, 2014 -- A Socialist in Canada, posted at Links International Journal of Socialist Renewal with permission -- Today, the Vancouver Sun has published a description of the troubled man who killled a guard in Ottawa two days ago and then entered Canada’s parliament building carrying his gun. He was shot and killed by police. The Sun reporters speak to people who knew Michael Zehaf-Bibeau while he lived in Vancouver during recent years and they describe an angry and troubled man grappling with mental illness and drug addiction. He has lived in Vancouver, Calgary and Montreal at various times in the past three years. He died at age 32. In Vancouver in 2011, he staged a robbery of a McDonald’s restaurant in order to get himself placed in jail for what he considered would be a form of drug treatment. After threatening a McDonald’s employee and demanding cash, he sat outside and waited for police to arrive and arrest him. Prior to his shooting rampage in Ottawa, Zehaf-Bibeau had been living in a homeless shelter in Ottawa for the past several weeks. Just before that, he was living in a shelter in Vancouver. Two days earlier, another Canadian soldier was killed by a man with mental illenss, in St. Jean-sur-Richelieu. The man drove his car into two uniformed soldiers in a random act of violence. Political leaders on all sides in Ottawa are calling Zehaf-Bibeau’s killling of a soldier and his entry into the parliament building an act of “terrorism”. It turns out that the deranged gunman’s actions are a political godsend for the government of Stephen Harper. Stung and weakened by the revelations by Edward Snowden and other civil rights advocates about the "Five Eyes", Cold War-era spying alliance of which Canada is a full partner, the government has been seeking to expand its Five Eyes participation, including giving more powers to its intelligence services. A recent article in the Ottawa Citizen explains some of the spying powers that the government is seeking to expand, including removing the right of people facing criminal or political charges to question in court undercover police presenting accusations against them. Opposition parties have offered nothing more than tepid questioning of the government’s intentions. The hysteria and posturing in parliament and in the mainstream media over Zehaf-Bibeau’s actions posit a “coming of age” of an innocent country, Canada, in a world awash with war and terrorism. Columnist Rick Salutin answers that absurd claim in a column in today’s Toronto Star. He points to Canada’s participation in most of the major wars of the 20th century and its 1970 declaration of martial law in response to the rising movement of the day for Quebec independence. Snowden’s colleague Glenn Greenwald spoke yesterday to CBC Radio One’s As It Happens about the shootings in Ottawa. His interview and the one that immediately followed with Rafal Rohozinski are important to hear. Rohozinski is the CEO of a online intelligence firm in Ottawa. He says that the likely cause of the two recent killings of soldiers in Canada was the documented mental illnesses of the two perpetrators. The cause of the incidents may well be the cuts begun decades ago in Canada to mental illness support that created a “deinstitutionalisation” of mental health treatment. You can listen to the CBC broadcast here. Greenwald and Rohozinski appear in Part 1. The emotions and rhetoric spilled over the tragic deaths of two Canadian soldiers contrasts with the silence over the ghastly news from Ukraine this same, past week. The New York Times and Human Rights Watch each revealed in separate studies that the Canada/NATO-backed government of Ukraine is using cluster weapons in its war against the rebellious population in the east of the country. The 2008 Convention on Cluster Munitions prohibits the use, transfer and stockpile of cluster bombs, a type of explosive weapon which scatters multiple submunitions (“bomblets”) over an area. As of October 2014, 108 states have signed the treaty and 87 have ratified it or acceded to it. Countries that have not signed the treaty include Ukraine and the United States. Canada has signed it but the government of Stephen Harper has refused to present a ratification vote to parliament. The war in eastern Ukraine has killed thousands of people and made refugees of more than a million. The news of the use of cluster weapons there has drawn not a peep from parliamentarians in Ottawa. CBC News has kept the story off its website. Not all print dailies in Canada have reported the story. Those which have, including the Globe and Mail and Toronto Star, have limited their print reporting to wire service stories that focus on predictable Ukraine government denials. So while some forms of “terrorism” that are not terrorism at all receive blanket news coverage and political attention, the mass form of terrorism uncovered in Ukraine is an embarassment best left unsaid and unreported.